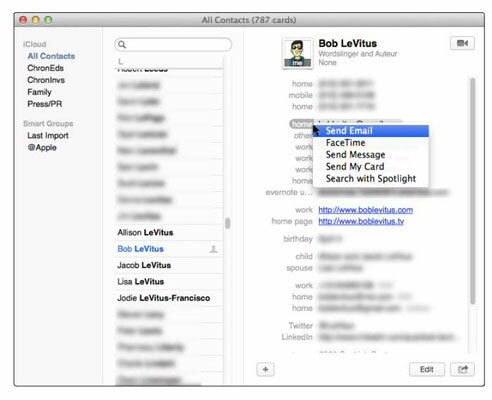 In OS X Mavericks, you don’t even have to open Contacts to send an e-mail to a contact or group contained in your Contacts. You see how Mail finds contacts or groups for you without launching Contacts. But if you already have Contacts open, this technique for sending e-mail to a contact or group is probably most convenient. To create a blank e-mail message to a contact, click and hold the label next to the e-mail address, and choose Send Email from the pop-up menu that appears, as shown for the Home label. The Mail program becomes active, and a blank e-mail message addressed to the selected contact appears on your screen. Just type your e-mail as you normally would. Send your vCard (see the following Tip) to this e-mail address. Search for this e-mail address in documents on your Mac using Spotlight. The information for each contact can be sent to others in an industry-standard file format known as a vCard (virtual business card). Choosing Send my Card works the same as Send Email, but instead of starting with a totally blank e-mail message, the message starts with your vCard enclosed. When the recipient opens the vCard file, all your contact information will be added to his or her Contacts (or other contact manager in Windows).